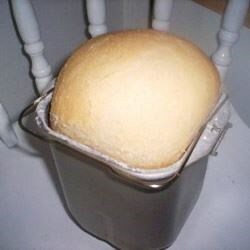 "This is a great bread recipe for your bread machine. It's easy and very good." There's no excuse not to whip up a crusty loaf of Irish soda bread this St. Patrick's Day! I think there is a mistake in this recipe...I only added 1/3 cup wheat flour to this and it worked fine. Use only 1/3 cup and it will turn out! This is the first loaf of bread where my husband admitted that he was glad we got a bread machine. Great for my left over buttermilk from holiday baking!!!!!!! I have had mixed success with two bread machines now, but this recipe has proven itself time and again. Plus it solves the riddle of what to do with leftover buttermilk from my holiday baking! A big gloppy mess! WAY too much flour. Had to throw the entire thing away.